It’s always around this time of year when people start wondering. When does ginseng come up? Usually that happens here at Wild Ozark from mid- to late-April. Today is March 14, 2018. This is the page where I’ll post the photos of our wild-simulated and true wild ginseng unfurling as it begins the growing season of 2018. I’ll have ginseng seedlings with me at the farmer’s market as soon as they’re ready to be potted. Watch the schedule calendar to know when I’ll be where and with what. 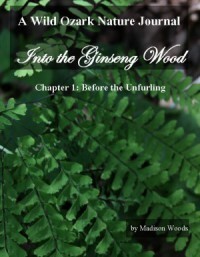 Check back here in April for the ginseng unfurling, or add this page to your feed readers. In the meantime, I’ll be posting pictures of the other native plants of Wild Ozark as they start to bloom. Those will be posted on the 2018 Spring Awakening Watch page. 042218 – The first year seedlings began sporadically unfurling over the past few days. None of the older plants are up yet. The blue cohosh (Caulophyllum thalictroides) is awake early this spring. I found some the other day, in three different stages of unfurl. The one completely unfurled is in a pot in the nursery area, the other two are in the ground in the same area. I missed the initial unfurling of the stem this year. I’m excited to see this plant because it is a native with “threatened” status in the state of AR and I only find it, like the ginseng, in certain little spots out here. The one in the pot came up from a berry (I didn’t separate out the seed), so that’s exciting too. I’ll gather more and spread them to some of the other areas that look right for it this year. Blue cohosh in early spring with leaves just beginning to unfurl. Blue cohosh in early spring with leaves still unfurling. Blue cohosh in early spring with leaves finished unfurling. 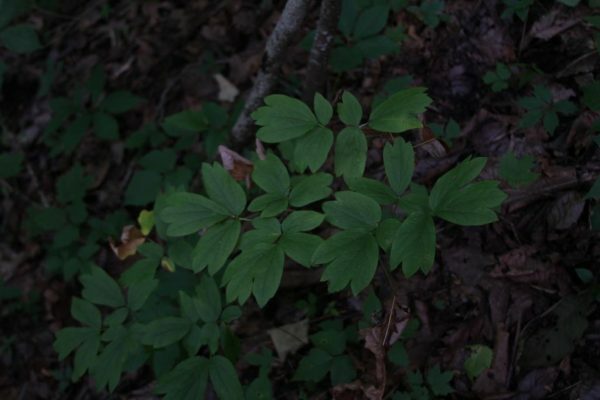 It is an American ginseng companion plant and enjoys the same kind of habitat ginseng prefers – mixed hardwood forests in eastern/southeastern North America with deep, cool shade, loamy soil, and good leaf-litter/ ground cover to keep the soil moist and cool. I don’t think anyone uses this herb medicinally often anymore, but it was part of the pharmacy for Native Americans. Parts used are roots and rhizomes. This is an herb that shouldn’t be used as an ordinary part of self-care. It is useful in very specific circumstances. I’ve used it in conjunction with black cohosh by alternating between tinctures of the two every three hours to bring on labor when my middle child was due. Not only did this regimen bring on the labor by the appointed hour when I would have undergone induction at the hospital, but it made the labor easier. Other uses include easing the cramps of menstruation or to bring on menstruation. Keep in mind that anything useful for starting a period or to bring on labor is likely also to be an abortifacient. Blue cohosh as a medicinal plant comes with some very serious warnings attached (see link below). We have a ginseng habitat garden and nursery. If you are local and want to come out to see how ginseng looks in a restored natural environment, it’s a great opportunity to do that. If you have any questions along the way or just want some help with photo identification of plants, feel free to email me. Although my information is about ginseng and ginseng habitat in the Ozarks, the information applies to anywhere this amazing plant calls home. Some of the environments might have different trees and shrubs, but most of them are common throughout the area where ginseng grows. For those local to northwest Arkansas, we have a nursery. We offer potted plants for specimens or re-establishing habitat. For the spring 2019 season I am not “really” operating, but if you contact me I may be available to let you in to dig your own seedlings. With enough advance notice, I can probably get some potted up for you. Season starts in mid-to-late April, but for the month of May I’ll be out of pocket. An appointment is necessary. Email me to set one up at [email protected] I’ll be back to actively promoting this aspect of Wild Ozark later in 2019 to be ready for fall planting season. If you have tips or links to articles you want me to add to this page, leave a comment and I’ll move them to the body of this page. Click here for Regulations and Good Stewardship brochures from all ginseng producing states (FREE). Ginseng Sustainability: Conservation or Profit? So How Does Ginseng Taste? Some of these links may be old or broken. If you find one that doesn’t work, leave me a comment and I’ll remove it if I can’t find the new link. How to Age Wild American Ginseng – another excellent graphic from Bat Cave Botanicals. Ginseng Hunting by Phyllis D. Light – a delightful story by a woman who grew up in the woods hunting seng with her father and grandfather. A fun post from Steven Foster about the debacle that is Appalachian Outlaws. A story about Joe and Herman Brock, Ozark ginseng diggers (submitted by Mark Martin, Joe’s grandson and Herman’s great-nephew) This account is a treasure, very interesting reading, too. From the NIH, about the effectiveness of ginseng for various ailments. A great article from Dr. Laurell Matthews, ND about the virtues of ginseng. This is my favorite of our books on the topic of ginseng. For color photos of ginseng and companion plants, you won’t find a better one out there. Of course, that’s my biased opinion and I’d love to hear what you think of it. This isn’t a “how to” book, but a celebration of the beauty of the plant and the habitat where it lives. Anyone who wants to learn to find ginseng will benefit from seeing these photos because it’ll help with recognizing habitat. A photo-filled book about American Ginseng and Companion Plants. I also have another book out to show you the difference between the look-alikes and ginseng. Some of these photos are in my other books, but this book focuses only on these things and includes more information than the other chapters in the other books. The new edition of Ginseng Look-Alikes is now available in paperback format! The book has several very good reviews and one terrible review. Of course, Amazon shows the terrible review first and it takes up most of the review space because the commenter was very detailed and even posted photos to demonstrate his complaint. I took a lot of his issues to heart and rewrote the book. His complaints were valid and I did appreciate the time he took to make the comment. However, the placement of the review is killing my sales of that book. If you decide to take a chance on it, please leave a review if you liked it. If you didn’t like it, please email me and if it is something I can do something about, I’ll do what it takes to make it a better resource and refund your money if you were terribly dissatisfied. The Wild Ozark™ Nursery will be open by appointment only (except during the month of May) in 2019. This is a great place to see the plants growing in a restored natural habitat. You can come pick up your plants and tour the Ginseng Habitat Demonstration Garden. We won’t be doing mail order of rootlets or plants this year. As I run across these, I’ll post them here. If you have the link to one, post it in the comments and I’ll add it. I have a mystery plant to decipher. Last year I went to the woods and took a root division of a plant I wanted to grow in the Ginseng Habitat Demonstration Garden. I put that root cutting into a pot and placed it in a sheltered spot in one of my nursery terraces. The summer faded away and fall came around. One day I went out to the nursery spot to check on the plants I’d tucked in for the season. That plant I’d divided and potted was on the ground. I re-potted it. Checked on it again the next afternoon. On the ground, bare roots. Again. Something – most likely a squirrel – did not want that plant in that pot. By now I’d forgotten which plant it was. And of course I forgot to label the pot. I can’t even remember which plants I’d taken cuttings from during the year, but I have a few possibilities to choose a “most likely” candidate from. Now it had become a mystery plant. I know it’s not ginseng and I know it’s not bloodroot or goldenseal. Those are three I can recognize on sight, with or without leaves. It could be doll’s eyes, black cohosh, or a fern of some sort. Or some other interesting plant I found while out taking a walkabout in the woods. Anyway, I put it into the pot again, covered it up with soil and leaves, and brought it into the house. Foiled the squirrel, finally. But I still don’t know what the plant is. It began to unfurl the other day. Soon I’ll have the answer to my mystery – unless it’s doll’s eyes or black cohosh. I still have a hard time telling those two apart until the plants are mature. But at least the choices will be narrowed down. Here’s how it looks today. Watch this page if you want to watch the mystery plant unfold, too. Now it’s beginning to look like something, but I still don’t know what! I still don’t know what it is, but it’s beginning to look more and more like perhaps a rattlesnake fern. The ginseng habitat garden is *usually* open by appointment beginning in May. However in 2019, the garden is closed during the month of May. I will have limited amounts of seedlings to sell this year, and you can make an appointment to come see the garden during another month, just not during May. The nursery and ginseng habitat garden will be back to normal functioning after the month of May 2019. Ginseng usually unfurls from mid-to-late April here. By that time, it’s possible none of the early flowers of bloodroot, rue anemone, or goldenseal and blue cohosh will be blooming. Those bloom very early, so if you want to see these members of a healthy ginseng habitat, you should plan to come in early April. Sometimes they bloom as early as mid-March. I’ll try to post photos to let you know when it starts this year. Will update this as soon as I have started to see signs of life in the habitat. Check back in late March. If you’d like to visit the ginseng habitat garden, contact me by filling out the form. It’s free to visit and I have seedlings for sale but no purchase is required. An appointment is necessary to make sure I’m home when you want to visit. All visitors are required to fill out a liability waiver, which will be sent to you along with the address and phone number when the appointment is arranged. This year will not be shipping potted seedlings. I will allow some ‘u-dig’ for first year seedlings and may be able to get a few potted up with advance notice. But 2019 is not going to operate by the usual schedule because the month of May is a problem this year due to personal schedule conflicts. The first week of April is ordinarily too early for the ginseng to unfurl, but there are companion plants making a show already. Here’s a tour of the Ginseng Habitat Garden 2018 flowers on April 6. Note: The Wild Ozark Ginseng Habitat Garden will NOT be open to visitors this year in May. Right now the weather is so unpredictable that it’s hard to schedule visits, but if you want to see it during April, or after the start of June, just use the form above. Rue anemone and bloodroot are among the first flowers to bloom in the habitat. Prints are available of these photos, but I don’t have them listed in the shop yet. Email me if interested. On the driveway side of the creek I had a few pots of various plants. I’d forgotten to label them before the top growth died back, so I was unsure of what was there. This morning I saw that a few of them had started unfurling. Bloodroot, goldenseal, and wild hydrangea were among them. Those need to be in more shade, so I moved them across the creek into the habitat. Once on the other side of the creek, I did a bit of looking around to see what else might be waking up. I had divided some black cohosh last year and potted some of them. The ones in pots were coming up, but no signs yet of the ones in the ground. One of the black cohosh plants unfurling. Notice the flowering stem bud down at the base. This bud at the base is where the flowering stem will rise from. You can see it’s getting ready to emerge. One of the black cohosh from a smaller cutting. It probably won’t bloom for another year or two. In one of the other pots, I found the Giant Solomon’s Seal coming up. I’ve had a very difficult time transplanting this to the habitat garden, so I am hoping that by growing it in the pots over the past year that it will be happier once I move it to the ground. Found something interesting while heading up the trail to see if the Virginia snakeroot was up. This poor little mouse met an untimely end, probably early this morning. Since the only thing eaten was its head, I assume it encountered a mink or weasel. They tend to enjoy things like that. A fox or other critter will find the leftovers later and probably make good use of it to feed kits. At Wild Ozark we have a healthy balance between predators and prey animals. It does mean that some things die so that others can live, but isn’t that true of all life? We only protect our chickens and household from predators. All wildlife is free to live as it would naturally on the rest of our acreage. Except some of the deer encounter my husband, the predator who likes to kill a few deer each year. After inspecting the mouse, I looked for the snakeroot, but didn’t see any. The reindeer moss has been growing, though. It seems like reindeer moss grows best in open areas, so I’m not sure how much longer it’ll do well where it is now. I’ve never tried transplanting it, and don’t really have a location similar to the spots I’ve seen it growing abundantly. Mayapple is fairly adaptive as long as there is some shade, so it grows in more than just ginseng habitats. But it’s a frequent companion plant, too. The Ginseng Habitat Garden was logged thin about twenty years ago. It’s still not an ideal habitat site for ginseng, but each year brings it closer to the balance it once had. This year, for the first time, I found trillium growing naturally there. I’ve transplanted a lot of plants to the habitat, but this was not one of them. So it pleases me to see it. It means that the habitat is becoming more friendly to the plants that like deep shade and loamy soil. These two characteristics are critical and the habitat still has a long ways to go before it gains the soil texture it needs. But I am seeing progress! It’s mid-March 2018 and I’m watching for the first native flowers of the Ozarks to start blooming. I particularly love the ephemeral blooms of early spring, like the bloodroot and Dutchmen’s breeches. 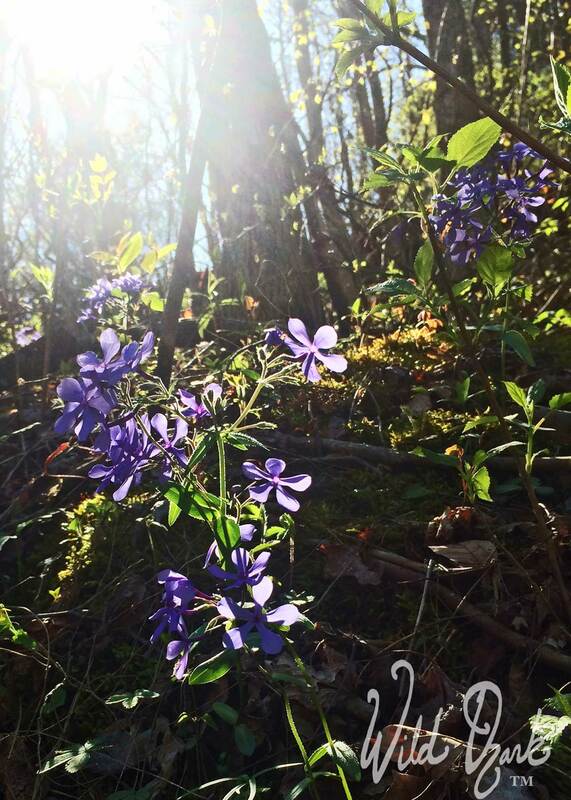 Scroll down to see pictures and keep up with what’s blooming at Wild Ozark. If you’re looking specifically for the ginseng unfurling/blooming, you’ll find that on the Ginseng Unfurling Watch 2018 page. 3-26-18 The false rue anemone is blooming along the driveway. Farther from the house, down the road heading to pavement, I saw the bloodroot finally making an appearance. It’s not up yet here, but should be soon. Toothwort is abundant, corydalis still is blooming. The only photo I was able to get so far was of the false rue anemone, with my cell phone, and it didn’t come out well enough to bother posting it on the website. Once the rain clears out I’ll try to get down the driveway with the real camera. 3-20-18 Today I spotted one of my favorite spring flowers blooming along the roadside. So, while it’s not technically ‘at’ Wild Ozark, I consider it to be ‘Wild Ozark at-Large’, since it was only down the dirt roading leading here 🙂 Everything here is a week or two behind the surrounding area. We live in a little microclimate. Not much else blooming yet at Wild Ozark proper, but I did find this Cutleaf Toothwort getting close. 3-18-18 Not a flower yet either, but the buds of the Redbud (Cercis canadensis) tree are swelling. The flowers are edible and make a colorful addition to salads. Here’s a pic from this morning that I took while we were bringing hay to the horses. It’s a terrible pic, but the limbs were swaying and I didn’t have the good camera with me. I pulled a muscle in my back yesterday and moving around is a bit of a problem today, so it’s not likely I’ll be going back out there to get another photo before the flowers open, so this one is the best I’ll get for now. Next pic will be of flowers, not buds. Redbud buds. The flowers bud out and bloom on this tree before the leaves even begin to swell. 3-17-18 Not a flower, yet, but the first leaves of one of my favorite native flowers – Yellow Trout Lily (Erythronium americanum). When it blooms it too will be yellow. I’ll post the picture of it as soon as I see it. 3-15-18 Noticed that the Pale Corydalis (Corydalis flavula) is blooming along our morning mile hike route. Of course I didn’t have my camera with me to capture it. Today we have appointments in town and tomorrow is the first market day of the season. So unless I can get out there this afternoon before it’s too dark for a photo, it’ll be a few days before one shows up here! (update – got a pic, see below!) The flowers are small and yellow with foliage that looks a lot like Dutchmen’s Breeches (ferny and dissected). It’s a relatively small plant and is one of the first native flowers of the Ozarks to bloom. If not for the bright yellow color of the flowers, it would be easy to miss. Corydalis grows in the shady edges of the woods. The one pictured below is growing in a bright sunny spot that opened up when we had more of the landslide come down this past winter. It’s not happy in full sun, though. I’ll probably move the ones located here to pots for the nursery. Corydalis belongs to the same Family as poppies. Like poppies, Corydalis is full of alkaloids, compounds which usually mark a plant as being medicinally active. It was used by native Americans and early American doctors, however, the plant is toxic and even small doses can cause tremors and convulsions. This could be caused by incorrect preparations (i.e. water extract versus alcohol or oil), but it’s not one I’m inclined to experiment with and I can’t recommend it as a native medicinal option. According to the reports I’ve read, the way native Americans used it was to burn the plant on coals and fan themselves with the smoke. It was said to “clear the head“. I haven’t found any references to explain what that means or how it worked. Yellow Corydalis (Corydalis flavula) is one of the first of the native flowers to bloom at Wild Ozark. 3-8-18 Usually the first plants to show signs of life with blooms here are the Vernal Witch Hazel (Hamamelis vernalis). These sometimes bloom as early as January and February. This year they bloomed in March. to show up soon. None yet when I checked yesterday, though (Mar 13). Add this page to your RSS feed or check back often to see what’s blooming next! What’s your favorite flowers of the Ozarks? What’s the Difference between Native and Ornamental? Native flowers grow in the area naturally. They are plants that evolved with the local habitats. Ornamental plants are imported, hybridized or modified in some way to highlight the showy features of the plant. Unless you’re shopping specifically for a native plant, at a nursery you’ll most likely get something that originated elsewhere. Nurseries stock plants most likely to sell to the public and often that is a bright, showy flower. Some nurseries, like Wild Ozark, specializes in native plants. We specialize even further – native woodland plants of the American ginseng habitat. I’ll start bringing plants to the market in April, so keep an eye on the calendar if you want to know where to find the booth. ‘Naturalized’ plants are mostly foreign plants that found their way to new habitats here in the US a long time ago. Some were brought with the settlers, some purposefully and some accidentally. These plants adapted so well to the environment that they began out-competing the native plants. Japanese honeysuckle and Chinese privet are two examples of this type of plant. Autumn (or Russian) Olive is a third. On this page I’ll chronicle the life of ginseng through the seasons, from unfurling in spring to die-back in fall. The most recent photos are first, so if you’re interested in how ginseng looks in a season other than the current one you’ll have to scroll down. Only three prongs left (it was a four prong) and falling apart, this is how ginseng looks in November in the Ozarks. A closer view of the curled and dead leaves on the ginseng in November. The ginseng is looking pretty ragged now. Some are bug-eaten, most of the berries have dropped and you can see the leaves here and there are beginning to yellow. I have some pics of the ginseng plants growing under the cedar trees at this post, taken on Sept. 1. (ginseng on Sept 1) This is the same plant as the previous photos. One of the prongs are missing and the berries are all gone. Only the flower/berry stalk remains. Some of the other plants in another location still have a few ripe berries clinging. More than 70 color photos of ginseng and the companion plants throughout the growing season. What does ginseng look like in summer? Berries are starting to turn red on the ginseng. This year we’ve had a tremendous amount of rain and so there’s a lot of mold/mildew on the seed stalks. Some of the seeds are falling off green or the berries are decaying before they ripen. Not only does the humidity cause the problem, but with all the extra rain the undergrowth is just choking out the air flow beneath the trees. American ginseng in late June still has green berries. This is one of the few survivors in the area where it lives in my woodland nursery area. The fierce flash flood on the 15th washed away most of everything else. But it sure cleaned out a lot of the clutter and underbrush while it was at it! The berries are filling out. Looks like this year saw great pollination. Looks like the flowers got good pollination this year. Lots of filled out berries on this ginseng! What do ginseng flowers look like? The ginseng flowers are opening a few at a time and it even has a berry or three now. Closer view of the flower cluster and berry. Just posted pictures of how ginseng looks right now. Some flowers are beginning to open, but many are still in tight buds. I just posted a bunch of pictures from a ginseng habitat to the blog (no ginseng, though). I’ll try to get a current photo of the ginseng plant shown in last month’s post. It looks close to the same, except some of the flowers are beginning to open. The ginseng is fully unfurled and flower buds are still closed. Goldenseal is finished flowering and has small green fruit globes. Bloodroot seedpods are still closed. Wild ginger bloom is faded and old. PawPaw trees are just now beginning to put on leaves. 4-prong ginseng at the end of April with flower buds. 20 days after unfurling. Blue cohosh, goldenseal are blooming. Solomon’s seal is growing taller with tightly closed flower buds dangling underneath starting to arch forms. The ginseng flower stem and buds are still tight as well, but I didn’t get a good picture of that today. I’ll try to take one soon and post it. What does ginseng look like when it first comes up in spring? Went out this morning to see if I could find any ginseng unfurling. Found one, possibly, but will be more certain tomorrow. Here are the other plants of the ginseng habitat this morning. Seeds left over from fall planting are still in the refrigerator. As soon as I get the next chance when the weather cooperates, I’ll plant them. They’re beginning to sprout. Ginseng seeds sprout in April. The seeds are very fragile at this stage. If you break off the little root, it will not grow into a plant and will die. This year the seeds I have didn’t do the usual “smiling” stage, where the seeds swell before the rootlet emerges. They just went straight to sprouting. Many are not yet sprouting and I’m wondering if they might wait until next year to do so. I checked to see if they float, but all of them sunk and this indicates live seeds. So if not this spring, then perhaps next year they will emerge as yearling plants. I’m a few days, possibly a whole week late in reporting this, but bloodroot is blooming now. So are the dutchman’s breeches. Pink and white trout lilies were also blooming the other day. Not yet for the yellow trout lilies. Cutleaf toothwort has been blooming a week or so now, too. Line drawing from the USDA, NRCS. 2015. The PLANTS Database (http://plants.usda.gov, 5 July 2015). National Plant Data Team, Greensboro, NC 27401-4901 USA. There’s a Virginia creeper (Parthenocissus quinquefolia) seedling creeping up toward the light in my spleenwort fern (Asplenium platyneuron) container. I watched it for a few days with a suspicious eye as it unfurled, because I thought it might be a poison ivy. This isn’t one of my favorite plants. I’m only fascinated with it because I’ve never seen the creeper at this stage before. Actually, I did get online to make sure it wasn’t something else I suspected it could be, but the seedlings of that other plant look nothing like the seedling growing in my pot. A first year ginseng seedling the second day after unfurling. I think I’ll keep my little seedling and bring it with me to my market booths for show and tell. But it’s going to have to get in its own pot soon. I need the little fern in its own pot, free of the creeper. These little ferns are called Ebony Spleenwort, and they adapt well to the fairy gardens in globes, bowls, and other containers. I do love these. They’re very plentiful here at Wild Ozark, but I’ll begin propagating them in woodland beds this year. That’s more sustainable than taking them from their wild homes. Here’s one of the Bowl Terrariums with a maturing Ebony Spleenwort growing in it. I sell these as kits at my Etsy shop, and I’ll have them at the market booth this year. Any plant with ‘wort’ in its name was once used for medicine. 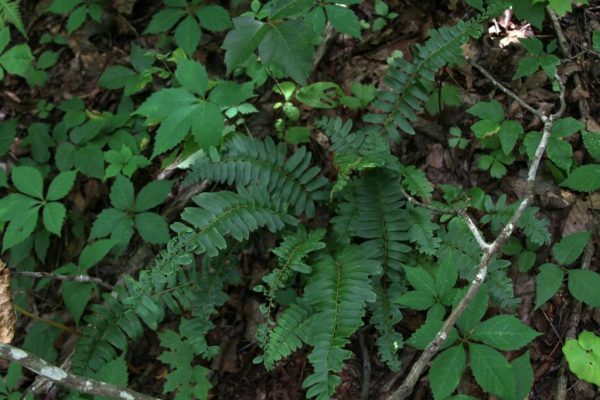 This fern was used for promoting menstruation and for chest congestion. The leaves are supposedly used as a tea. I have no plans to experiment with remedies using this plant. I like it for the fairy gardens mostly. The other day I spotted some male flowers on the witch hazels down at the creek, but I didn’t have a camera on hand. I’ll try to get some pics of those before they disappear. That, too, is a new thing for me. Until Steven Foster posted his photo of one on FB the other day, I didn’t know witch hazel even had male and female flowers. I think I may have missed the female witch hazel flowers on the vernal variety. I’m not sure how that happened, since I pass them everytime I go to town, but maybe I have been less attentive than usual in February. Or maybe they bloomed earlier and were knocked off by rain before I had a chance to see. No telling. I’ll try again next year. I’m so excited! We just got the approval notification for our application to the Fayetteville Arkansas Farmer’s Market. This is a juried market. Last month we had an appointment with the review board. We brought our crafts for inspection – the fairy houses, fairy gardens, forest folk, and keepsake boxes. We have another review for the syrup and ginseng/woodland plants, but those are also fairly unique and so should be accepted as well. The schedule? That I don’t know yet. Early in the season we’ll likely be there every Saturday starting March 31. Later in the season, they may boot us out to give space to the more tenured vendors with produce just coming in. Watch my schedule page or email me to inquire if you need to know whether we’ll be there on any given Saturday. Someone asked me yesterday about how ginseng stewardship benefits the landowner. It stumped me at first, because I’d never considered it from that angle. To steward something is to manage or take care of something. The short answer to this post’s question is yes. Stewardship benefits the landowner, especially if they want to have a long-term relationship with ginseng. The word “relationship” is key to the true meaning of that answer, as you’ll begin to understand when I describe what I consider to be ginseng stewardship, farther down the page. Obviously, it benefits the ginseng for someone to think of it as a long-term resident and not just as a root occupying space in their forest for the next 5-10 years. How Does Ginseng Stewardship “Work”? In this example, I’m talking about wild-simulated ginseng, and not ginseng grown as a woodland crop that is tended in the way a gardener tends vegetables. The wild-simulated ginseng will generally be left to fend for itself once the seed is planted. Stewardship comes into play the moment you decide to give it, and the future generations of it, space in the forest to call home – not just a 5-year lease on a plot of ground in the woods to be terminated en masse at will. If a landowner begins planting ginseng in year 1, then plants every year thereafter, in 7-10 years it would be a good time to start digging roots. It’s legal in 5, but the roots are still small then. Let’s just say you wait 10 years and each year you planted seeds. By the time year 10 rolls around, the ones you planted for the first 7 years will be flowering and producing seeds and offspring (they begin reproducing in year 3). If you did this without fail each year, barring a disaster of some sort, you’d have quite a lot of ginseng growing and reproducing. Now when you harvest in year 10, only take ½ or less of each colony’s reproducing adult plants. Each colony should have at least 100 plants total (of mixed ages). Replant the seeds from the ones you harvest. Done in this way you will always have ginseng for the rest of your life and the lives of your children and your grandchildren because the colonies would be self-sustaining and taking your percentage won’t cause them to decline until all you have is a few. Ginseng in spring, a little more unfurled by the end of the day. Here on our property, the suitable spots aren’t large enough to plant full acres worth. Each spot is a little microclimate of perfect conditions, and the largest area like this is only a few thousand square feet at most. So we plant these pockets as we find them, if there isn’t already ginseng on them (it’s my attempt to avoid genetic pollution). We haven’t started harvesting our own roots yet; we’re still on the 10-year plan and only dig a few for personal use. The ones we planted several years ago are now reproducing and we’re replanting those seeds in the same colonies and in a few more years those spots will all be ready for us to start harvesting a percentage of the reproducing plants. Most of our forests had been logged at some point before we bought it and so they’re only just now beginning to recover and create stands suitable for ginseng again. There are studies, (here’s a link to the abstract of one), that shows delaying harvest only a couple of weeks and taking only a certain percentage will lead to sustainability. I’ve read before that taking even 50% of the adult plants in a colony will not do it harm the sustainability of the colony if the seeds from those plants are planted back at the time of harvest in the same colony space. Stewardship also means recreating natural habitats where possible. In some of the logged areas, I’m trying to keep the thorns and brush out and am planting spicebush and pawpaws instead. Besides poaching, nature takes some of the plants. You’ll have to take into consideration the deer and poaching and other animal predation, or severe weather conditions that can take out a percentage of your colony. One year we had a pretty bad ice storm that took out the tops and felled of a lot of trees. In one of our largest good habitat areas this destroyed the colonies because it let in too much sunlight. Then the poison ivy and underbrush choked it all out. This particular habitat consisted of acres, actually, and not just little pockets. It was a heartfelt loss. That ice storm would need to be factored in before deciding how many plants the colony could afford to lose in harvest. In this case it was none. People can and do plant and dig all of the mature plants from the beds they’ve established. And then replant, just like any other crop. Just like growing a tree farm that is clear-cut and replanted. This treats it more as an agricultural product, which just isn’t how I want to interact with our forests. In the strictest sense of the definition, this is still “stewardship”. Ah-ha! The word is a phrase: NATURE FARMING. It’s also “wild-simulated”. What I want is to know that at least some of the ginseng out there is finding a permanent home. That is what I mean about stewardship. It’s a win-win strategy. Landowner gives to ginseng space to live a natural life. The ginseng gives to the landowner in the form of truly naturally grown, potent, medicine from the Earth. Not only that, in natural areas there are entire ecosystems to observe and learn from. I like knowing that ginseng is still out there somewhere enjoying the shade of the old trees. That they enjoy the company of their green-friend companion plants. Maybe this is a bit too woo-woo for some of you. But I like knowing that out there somewhere, people are respecting the way this plant once grew. 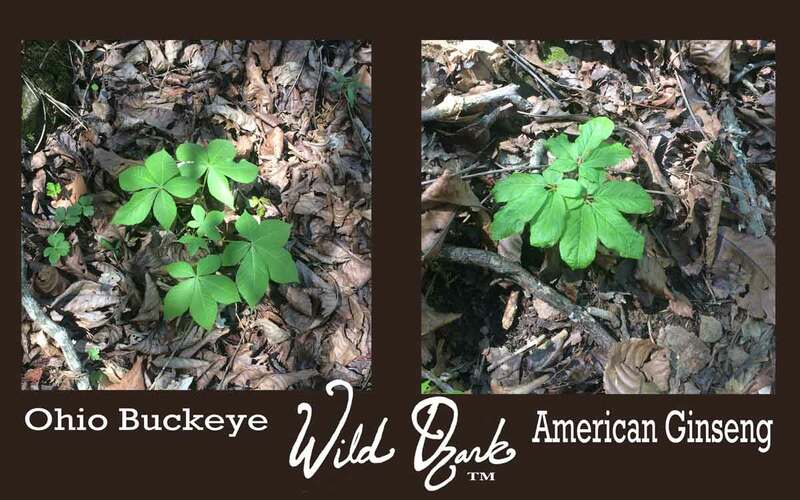 That those with wilderness are helping little pockets of ginseng find a permanent place on their land. And I know a lot of you do it without thinking about it. I just want you to know that I thank you for it. Here’s a page with links to a lot of other articles about ginseng here on my blog and out in the internet. In the end, stewardship does serve the person AND it serves the thing being “stewarded”. I suppose, if money is the bottom line, this may sound like bad business. For Wild Ozark, though, it’s not just about the money. It’s about stepping out of an anthropocentric worldview. It’s about having a mutually beneficial relationship with the land. A Kindle Picture Book from Wild Ozark makes a wonderful anytime gift for yourself or the nature lover in your life! The links below are ways you can follow me or get in touch. I’m always open to questions from readers so feel free to email me. If you have plants you suspect might be ginseng, I’ll be happy to take a look at a few pictures for you. My hope is that you’ll love this plant the way I do and want to become a steward and protector, which doesn’t mean you can’t harvest but that you harvest sustainably. If American Ginseng is your passion, you might enjoy American Ginseng & Companions. Although it’s not “no-tap”, it combines all of the photos from the first three “Into the Ginseng Wood” picture books, plus an added chapter on ginseng look-alikes. At my Amazon Author’s page you can see all the other books available and sign up to be notified when future books are published. I also write Ozark-inspired fantasy under the pen name Ima Erthwitch. I hope you’ve enjoyed the Kindle picture book and will take a moment to leave a review with Amazon for me. I appreciate all honest feedback because it helps me to improve my products in the future. This is a collection of nature sketches and journal entries from late September through early November. How to Find Ginseng? First look for the right habitat. Want to know how to find ginseng? Look for the right habitat. The easiest way to do that is to look for companion plants. If you’re looking for information about WHEN you can plant ginseng, then this article might be more helpful: When Can You Plant Ginseng. SPRING Today is March 20 and it’s either the first day of spring or nearly time for equinox. Here at Wild Ozark, not too much is blooming in the ginseng habitats yet. However, it’s still a good time of year to look around and find the woodlands most likely right for planting, growing, or stewarding wild American ginseng. It’s easy to see where the hillsides stay shady. Look for the carpet moss and Christmas ferns. Stay away from woods that are full of cat briers or wild rose unless you’re in the mood to do a lot of work keeping them cut back until the forest canopy blocks the light more. Things you’ll soon see in the ginseng habitats include blooms of the following flowers: Cutleaf toothwort, Bloodroot, Trillium, Trout Lily, and Spicebush. Where these flowers bloom it’s likely to be good ground for ginseng. Wild ginseng will start unfurling here after the bloodroot blooms. Usually I’ll find seedlings unfurling sometime around mid-April. This year a friend of mine has reported hers are already starting to rise and it’s not even end of March yet. That’s really early. There’s still time to plant bare-root seedlings if you have them or seeds if you can do it without damaging the already sprouted ones. Soon it’ll be time to plant out transplants or find places to hold them in the woods until fall. I’ll have seedlings at the Huntsville (AR) farmer’s market and the Fayetteville (AR) market beginning in May. This year I’ll also try shipping them, but if the first attempts result in damaged or unhealthy plants, only local pickup will be available. I’ll refund any damaged orders. Use the button below to pay for reserved plants to pick up later in May, or to mail-order plants that will be shipped in May. (More information is on that page). FALL September 20 2017 – It’s full-swing harvest season now, and plenty of you are out in the woods looking for ginseng. I hope you’re either on your own property or have permission from the landowner, wherever you are. In some of the locations where ginseng is native, the berries are red and this makes spotting the plant from a distance a little easier. The plants begin to take on a yellowish color, too, which is another visual aid. However, in other locations, plants may already be past the fruiting stage with only a red berry clinging here and there. Although the plants may be yellowing, they may already have dropped some leaves or bugs have eaten some of them, making it harder to know if the plant you see is actually ginseng. A short version summarizing my idea of sustainable harvest plan is farther down on this page. Many people are asking where exactly can they find or go to dig ginseng. If you’re asking that question, you probably won’t like the answer. Legal season for digging for ginseng is Sept. 1 through Dec. 1. If you have the proper habitat, I encourage you to plant wild-simulated ginseng using seeds from as local as possible a source. We usually plant our seeds in fall before it gets too cold. First look for the right habitat. Look for the kinds of places it likes to grow. Ginseng grows in moist deciduous forests of eastern North America, but only in locations that provide the perfect combination of deep shade, moist loamy soil, and the right mix of trees. It loves the north-facing slopes, but also grows on east, west, and rarely on south-facing slopes. Most often it likes the lower third of a slope, generally not the mountain tops. Here’s a map from the USDA (the map doesn’t seem to be working at the moment, but the link is correct) that shows where it grows in the United States. If you want to know if your state allows the harvest of ginseng, you can check to see if it’s on the map here. If not, then there are no regulations, which often means there is no legal way to do it. You’d have to contact the Plant Board or your local USDA office to ask more questions. Where EXACTLY can I find ginseng? You probably won’t like the answer. No one is going to tell you where you can go to find a specific patch of ginseng. The reason why is because if someone knows the plant well enough to tell you where it is, they’ll also know it’s endangered and easily exterminated from a single site. That person usually is either digging and maintaining the patch for themselves, or is protecting/stewarding the site so it can continue to thrive. If you don’t have property of your own with suitable habitat, or know someone else with the proper conditions, you probably won’t have anywhere to dig or grow. Some states might allow digging on public lands, but many don’t. Arkansas does not. So if you are someone who just became interested in digging some ‘sang to make some money from the roots, you’re most likely out of luck. Then the rest of this post might be very helpful to you. Keep an eye on my 2017 Ginseng Prices page if you want to stay abreast of current digger/dealer prices. You can read the 2016 price watch here. If you want to know how to find ginseng, first learn to find proper habitat. Check the USDA map to see if ginseng grows, or has ever grown, in the area of interest. For example, if you live in Arizona, it is highly unlikely that you will ever successfully grow this plant. If you want to try, then you’ll have to recreate the kind of habitat that supports it. It needs to NOT be all oak/hickory/cedar/pine. Ginseng will grow on any slope. North-facing is best, but it’ll grow facing any direction if the shade and moisture are right. It is most often right on north-facing slopes. There are sometimes “folds” on south-facing slopes that create mini-habitats on the north-facing inside of the fold. Once you have the right kind of trees and good moisture that comes from the right shade, then look for companion plants. It’s good to know the companions because ginseng (Panax quinquefolius) can be a difficult plant to spot. If you’re out looking for ginseng, you’ll know to look harder if you’ve already spotted the companions. The plant seems to show itself to some but not to others. I’ve spoken to many people who have never found it on their own even though they stood side-by-side with someone else who could point it out to them. I’m that way when it comes to hunting morel mushrooms. I cannot find them, even if I look exactly in the right kinds of spots. According to people who find them, morels have their own kinds of companion plants (and trees). During spring morel hunts, my friends come back with bags of gathered morels and I stand there empty-handed. Not so with ginseng. I can find that one! In one of my other posts about ginseng, I talked about choosing the best site to plant. Those tips can also help you find ginseng if you’re hunting it. And here’s a post that might help explain why you’re not finding it. Here’s another page that shows the ginseng plant as a seedling, two-prong, three- and four-prong, if you’d like to see how it looks as it gets more mature. ♥ Ginseng indicator plants, also called companion plants, are those plants, shrubs and trees that like to grow in the same sort of environment as ginseng. They keep the same company because they require the same habitat. Here’s a post with photos to answer the question “How does ginseng look in fall?”. Here’s a post where you can see how ginseng looks from spring through late fall on my page Ginseng Through the Seasons. If you like art, you might enjoy my sketch of “Ginseng in May”. For a general post on what a ginseng plant looks like, go here. If you have questions about ginseng that aren’t answered in this post, try my page on Questions About Ginseng. And if you were confounded by look-alikes all season last year and want a little help, check out my latest book “Ginseng Look-Alikes”. When I first go out to the woods, even in a place I know has ginseng, I have a difficult time spotting the first ginseng plant. They have a way of growing that makes them hard to see, but once you’ve found the first one it’s easier to find more. I think the first one somehow trains the eyes to see that form. It’s like this every time I go out. I have to find one first, then the rest become easier to see. See how the ginseng plant has a horizontal form? 47″ x 27″ Poster available from Wild Ozark’s RedBubble Shop for $32.66. If you’re scouting woods for likely places to either plant or find it, here are a few of the companion plants you’ll want to keep an eye out for. They’re much easier to find than ginseng itself. Look for goldenseal, black cohosh, pawpaw trees, American spikenard, virginia snakeroot, bloodroot, blue cohosh and wild ginger. Want More Ginseng or Companion Plant Pictures? There’s lots of photos on this blog if you’d like to just browse around a bit. Click on the “Ginseng Blog Posts” icon to get all of the posts that mention ginseng. Poison ivy is NOT an indicator plant. In fact, if you see too much of it, it’s an indicator that there is probably too much sunlight in that location. Poison ivy recently moved in and choked out a good ginseng habitat on our property. Before the ice storm of 2009, there was dense shade in that little holler. During the ice storm many of the trees fell and tops were snapped off, which then let in much more sunlight than had been there prior. And that’s what allowed the poison ivy to grow so densely there. It has taken nearly five years for the forest to recover to a point where the shade has returned to proper density. The ginseng suffered and much of it died or went dormant because lost trees opened a gap to direct sunlight for too many hours per day. Most of the ginseng companion plants can tolerate more sunlight than ginseng. 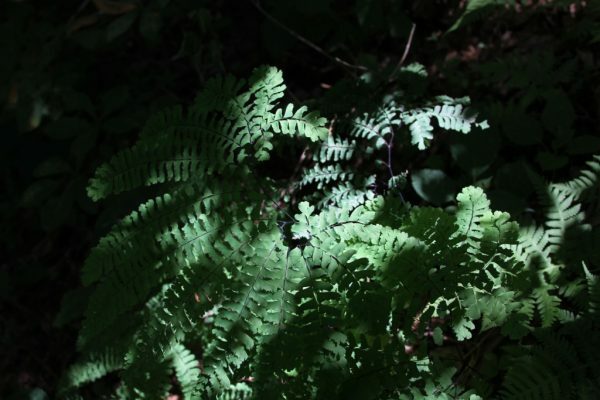 Maidenhair and Christmas ferns can tolerate more shade than can ginseng. But the ivy can also tolerate shade and thus it is still there even as the tree’s limbs have stretched to fill in the canopy. If we avoid more ice storms, it’ll eventually fade back toward the brighter areas and leave the deep shade alone. With a little help from the companions, you’ll be able to find suitable habitat for one of our greatest natural treasures, wild American Ginseng. The knowledge you gain will help you become a better conservationist if you choose to grow your own “virtually wild” ginseng rather than dig the wild. ♥ Ginseng has a legal harvest season. Ethical practices will help the plant to continue in the wild. Please follow the laws of your state regarding how and when to harvest. For the state of Arkansas, those rules are here (it’s a PDF file). I also go over specific practices to help the plant survive in my book Sustainable Ginseng. You might wonder why someone who conserves the wild ginseng wants to hunt it. Except when our personal stash is low, when I find wild ginseng (in season), I don’t dig it. I record where I found it and observe the habitat, photograph the plants and environment. To know where to plant, it helps to know the preferred habitat of ginseng. My hope is that you’ll become interested in growing wild-simulated ginseng, and for that you’ll need to know the kinds of places ginseng likes to grow. 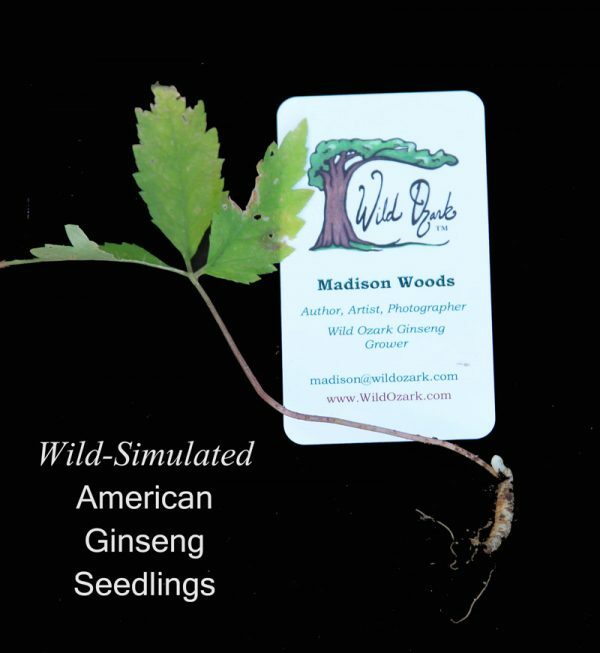 ♥ Wild-simulated, or virtually wild ginseng, is simply the practice of planting seeds and allowing them to grow naturally. No tilling, no fertilizing, no weeding (except perhaps in the beginning to clear out underbrush). Then in 7-10 years, begin a sustainable plan for harvesting. That plan would include taking no more than 50% of the seed-bearing plants from each colony, and only a small portion of the oldest plants. Always replant the seeds from those plants in the original area. This harvest plan would also be what I consider to be a good way to “steward” the wild if you intend to harvest it when you find it. What’s the Big Deal About Ginseng? If you have questions, please leave a comment or use the Contact link in the menu to get in touch. I’m always happy to help if I can. If you found this post useful, please share by posting the link to Facebook, Twitter or your favorite social center. If you want to stay posted on what’s going on with Wild Ozark, sign up for my monthly newsletter. Next year I’ll start doing slide show presentations around the area and those will be announced through the list as well. You will not receive my regular blog posts through this announcement list. The struggle for ginseng sustainability most often boils down to a choice between harvesting enough to make a good payday now, and leaving enough behind for next year’s payday, too. I suggest we look beyond a few years into the future. It’s worth looking perhaps decades ahead when making decisions on the sustainability of this endangered native plant. The diggers on this list will probably shake their heads at my answer to this question, lol. But I’m open to hearing your experiences if you have a different opinion. I’d love it if you post your comments here, so it can stimulate others to offer feedback, too. My approach to ginseng sustainability, patch conservation and stewardship is a lot more conservative than the average digger’s. With our ginseng here at Wild Ozark, our goal isn’t so much to make money by digging the roots but to maintain and grow a larger quantity of plants than are currently here now. We sell the seedlings at farmers markets and answer questions from the public wanting to learn about it. A first year ginseng seedling in April, the second day after unfurling. We have a public habitat in a structured, yet natural enough environment at Compton Gardens in Bentonville that was partially funded by United Plant Savers. This one is more available to the public than the one here at Wild Ozark, simply because of regular open hours and easier access. But it’s not so “wild” and has a long ways to go yet before it looks like a true habitat. For a habitat that more resembles one found in the true wild, I’m creating one here at Wild Ozark. It’s only open by appointment and requires a six mile drive down a dirt road in a pretty and remote area of northwest Arkansas. It’s an hillside once logged but is now beginning to fill out enough to support ginseng again. I want the wild-simulated plants we’ve seeded to be indistinguishable from the wild ones, which live here in protected pockets in areas far away from the ones we’ve seeded. Long-term, maybe the most important goal, is to have a lot of very old plants producing offspring and seed stock. I would guess that most diggers are ethical in that they only dig plants of legal age. Here in Arkansas that’s 3-prong and at least 5 years old. Most diggers I’ve talked to do practice leaving some of the old ones behind. They believe that if they replant all the berries and leave a few mature plants and all of the ones too young, they’ll have ginseng for the rest of their lives to dig. So will their grandchildren. This is probably true. Some older plants can still only have 3 prongs, but I’m not sure how hold this one is. Hard to tell without digging it up. However, the problem isn’t having plants generation after generation. Most generational diggers do a very good job of insuring that they do, and they take measures to make sure no one else comes along and harvests after them. The problem is that by taking the oldest plants, the colony overall becomes younger. The long-term effect of digging the oldest plants and leaving only a few mature berry-producing plants is that eventually the whole colony of plants become smaller in size as the gene pool is diminished. This may not become evident for several ginseng generations, and maybe not even in the digger’s lifetime. Each year, I do need some fresh roots to make the products I make (jams, syrups, candies, oils, remedies, etc. ), so we do dig some of our roots. The ratio of plants I take is no more than 5% from any one patch. That’s only 5 plants from a patch of 100, or 1 from a patch of 20. Even this conservative rate is above the amount of harvest that has a negative impact on the populations, when the populations are so small. Have any of you frequently encountered wild patches with more than or at least 100 plants in them? I have not. An ideal colony population is at least 100 plants. Even though I’m growing it here, except for my seed beds there are no colonies that large. Predation, weather conditions, mealy bugs, and general survival issues take a toll on our wild-simulated stands. Since there are no patches of at least 100 plants, my harvest rate is no more than 5% of the 3-prongs in a given patch, with every single berry planted back into that colony. I leave the 4-prongs entirely so they can reproduce. But I pull the stems to make sure no one else stumbles across them, if I get to them before roaming diggers. I wish I had some current studies to back up my thoughts on this, and I know they exist, they’re just hard to find online now. In a book I wrote a few years ago, I had links to studies, but those links are old and outdated. However, the document linked above in the quote does have a lot of information worth reading. Scroll down if you don’t feel like reading all of it to section 3, which is about the impact of harvesting. Please feel free to disagree and share your thoughts. I hope that some of you are indeed seeing large colonies of wild ginseng out there, and I’d love to hear first-hand how you practice sustainability in your harvests. Most of my own information on this is from my own very conservative digging, and from what I’ve gathered in reading reports like the one listed above. And I’d definitely love to see links to current studies on wild American ginseng sustainability! There is something magical about moist & shady places. I’m in the woods a lot, photographing and looking at ginseng. During my wandering, I see so many little microhabitats with moss-covered rocks, cool shady spots – nooks that look like they could be fairy hangouts. Christmas fern new fronds unfurling. Looks like a spot a fairy could call home, doesn’t it? Imaginary Worlds … or Just the Unseen Worlds? Add flowing trickles of water to the scene and even more citizens of the unseen world appear. Like sprites, nymphs, … and Water Priestesses. Perhaps only those of us with overactive imaginations conjure up such imagery. Or perhaps we’re just more receptive to knowing things that aren’t seen by humans. Anyway, I’m far behind on many things, blog posting included. I’ve been too busy being influenced by the woodlands and immersing in the realm of fairies. Over the last few weeks, I’ve finished a drawing of a Water Priestess. The second drawing in my “Rural Fantasy” series is “Water Priestess”. I’ll use her image on note cards and other artsy-type products. The note cards are listed at Etsy, and the prints will soon be listed there, too. I’ve decided to see if I can reach a larger audience through Etsy because our little online shop here doesn’t get many visitors. In an attempt to bring some of the magic of the habitats I frequent out to the ordinary world, I’ve been making fairy gardens. Our Fairy Gardens are available in round or teardrop globes. I’ve been bringing these to the farmers market in downtown Rogers (AR), but also sell the DIY kits online through our shop. Might list those at Etsy too. Then I thought some cute little mushrooms would go great inside them. So I started making and painting cute little mushrooms. After all that, I decided I needed to refresh my Etsy shop and see if I can actually sell any of these creations. They’re all listed at our online shop and at Etsy. We’ve also been working toward being legal, FDA-approved makers of our Shagbark Hickory Syrup. The next trip to the Arkansas Food Innovation Kitchen will result in our first commercially produced batch of syrup. On our first trip for this project, we cleaned the bark. Before that we collected the bark, which involves visiting several shagbark hickory trees. We don’t want to overharvest from any one tree, so we gallivanted around the woods gathering a little bit of bark from many trees. In the end, we cleaned and processed about 7 lbs of bark. It took most of the day, but we sure enjoyed using the commercial facilities for a change! I’ll write up a blog post about this experience as soon as I get a chance. Because I live so far off the beaten path, it’s hard to get enough people signed on to make actual herb walks very feasible. To remedy that, I’m developing “virtual” herb and nature walks that are sure to delight and please plant and nature lovers. I’ll still do herbwalks, “herb drives” in real life, though. See my post on my new Ginseng Habitat Garden project, scheduled to open to the public in May. I’ll get a walk schedule together before then and post it, so watch the blog or sign up for my Wild Ozark Musings newsletter. The first series of these virtual nature walks is “Into the Ginseng Wood”. This is available as individual “no-tap” chapters from Amazon (click each image below). Need to schedule a presenter? If you’d like me to bring some show-and-tell items and a few of the Green Ambassadors (the woodland herbs in pots), fill out the form below or email me. I can bring the slide-show if you have a screen to show it. I bring printed handouts and I like to bring books and DVD’s to sell, but if your organization forbids sales let me know. My fee is negotiable, but all travel and lodging expenses must be covered if it’s outside the northwest Arkansas area. 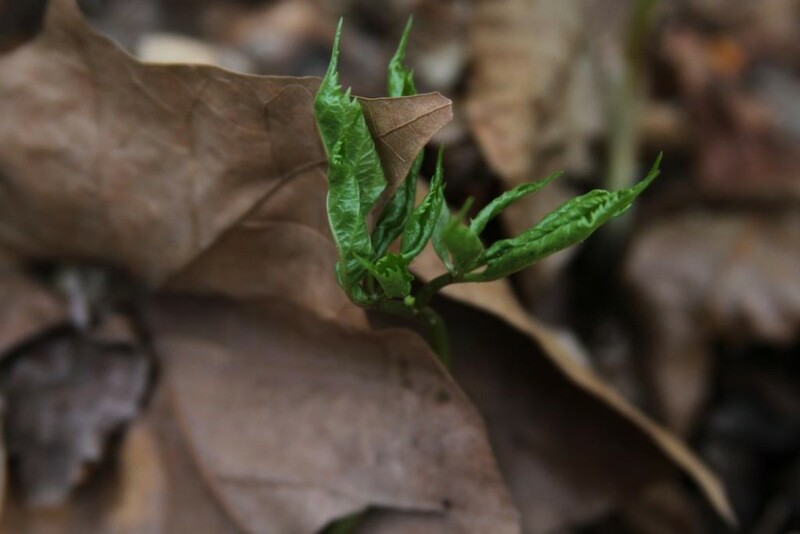 This American ginseng picture shows the plant as it unfurls in early spring. We’re in a holding pattern at Wild Ozark right now, which is in its own way a sort of liminal space. Rob has two hernias and we’re waiting for the surgeon’s office to call with his appointment day/time. So while he limits his movements to the barest possible, I’m staying nearby to fetch things so he doesn’t have to get up any more often than necessary. In the meantime, I’m working on moving the shop items to the new Nature Shop online and cleaning up my blog. The post below was an article originally published in 2014. I’m in the process of cleaning up some old articles and formatting them to fit the standards required for Instant Articles and AMP. So I hope you enjoy this <Rewind> episode. It’s not a special time of year right now, but kind of in between seasons. A “twilight” of the seasons. I didn’t think there’d be much to take pictures of when Rob and I took a hike on the mountain the other day. All of my favorite plants are already dormant for the remainder of the year. But being a “between” time, makes it a liminal sort of space and that’s my favorite kind of place to be. I was not disappointed in the photo opportunities. There were still leaves in various shades of color. We saw some of the largest oak leaves I’ve ever seen. gigantic oak leaf as compared to Rob’s sz 9 shoe. There was an old tree that had split and a long polished splinter jutted out from the trunk. The grain of that wood was beautiful! It looked like a black walnut tree and I wished we had with us a way to cut that splinter loose so I could bring it home. There were a lot of downed trees, probably from several years ago when the ice storm came. We lost a lot of trees on the mountains during that storm and I vividly remember the sound of trunks snapping as the stress of holding the weight of too much ice crossed the line of tolerance. Just then I passed a partially rotted limb that reminded me of a bone. A tree bone. And then I saw an Adam and Eve orchid, which surprised me. I didn’t think they’d still be out at this time of year. I knew they were early risers in spring and have a page or two in my photo essay book that talks about them. But I don’t recall ever seeing them in early winter before. I’ll have to play closer attention each year from now on to see if it’s a normal occurrence. At the time I composed the book, I didn’t have photos of the roots to show the “Adam” and “Eve”. Now I do. If you read the book and wondered how the roots look, here are some photos! Adam and Eve orchid showing leaf and connected bulbs. The leaf of an Adam and Eve orchid. Not sure what this is, looks like a ganoderma of some sort. It was huge. unknown tree fungi on horizontal overhead log. There were a few other green plants still, besides the cedars. There was an old moss covered stump on the ground with only a small opening. It looked like it could have been a fairy or sprite hideout. Here are some grape/rattlesnake ferns. One is bronzed and the other is not. It’s always hard for me to tell which kind they are, rattlesnake or grape fern, so I just lump them both together. Then we saw what we call “spring grass”. When you see this kind of grass in the middle of the woods, it usually means there’s a spring seeping up keeping the ground moist right there. I brushed the leaves away to see if the ground really was wet, and it was. The picture I took of the wet ground didn’t come out very good so I won’t post it, but there was a lot of moisture. You can see the spring grass, still greenish for now. After a bit more climbing we found a much better spring, and then another. Hidden springs are one of the most magical places I know. We finally made it to the logging road. I took it back to the house and Rob returned the way we’d come because he’d left the four-wheeler parked on the other end of the valley where we’d entered the woods. On the way back I saw some of my favorite grass catching sunlight in a bit of seed fluff. An updated and reposted article, originally written during winter of 2015. Join us as we go digging goldenseal. It’s the middle of winter right now and the best time to propagate this valuable medicinal herb. Hydrastis canadensis, or goldenseal, is a medicinal herb native to eastern United States. It is a ginseng companion plant, meaning it is often found growing alongside ginseng and the other companions in the same habitat. This photo shows what a mature plant with fruit looks like. Although still plentiful in the Ozarks, it is sometimes rare in other places. Goldenseal is a CITES listed plant, meaning that the root is under strict export regulation to keep it from becoming more endangered. Our goldenseal is a mixture of wild and wild-simulated, just like the ginseng. We’ve been planting seeds and spreading rootlets of both of these plants for so long that there’s no way to tell which are wild and which are wild-simulated anymore. To avoid genetic pollution in the ginseng, however, there are places I will never plant purchased seed and will only spread the berries from the existing plants. This spreading of the berries still marks the plants as wild-simulated, though. That’s the only difference between true wild and wild-simulated plants. Goldenseal is easy to cultivate and tolerates more sunlight than American ginseng, but still has fairly narrow habitat requirements. It grows in eastern United States in mixed hardwood forest where the soil is loamy and the shade is dense. Ours grows under a hickory, oak, beech, maple, redbud mix. It doesn’t grow where only the oak and hickory grow. The leaf mat under only those trees is too dense for the buds to push through in spring. There’s also a lot of fungal mycelia present in the areas where the goldenseal grows. In some areas there is white mycelia, but in the spot where I went today only the orange was there. 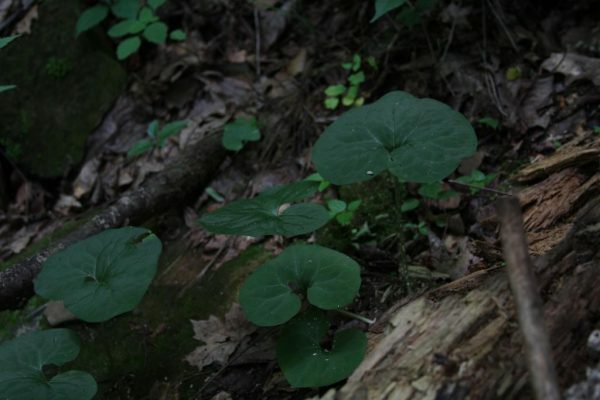 The air is cooler in the moist woods where this plant grows, because of the shade and ground moisture. It also likes the same sort of leaf cover on the ground that ginseng does, but it can grow in more sunlight than tolerated by ginseng. Goldenseal enjoys the company of the other ginseng companion plants, such as bloodroot, wild ginger, black and blue cohosh, etc. I suspect the reasons it is still on the endangered list is because of exhaustive harvesting techniques and habitat destruction due to logging and development (the same reasons ginseng is endangered). Digging goldenseal can be easily done in a sustainable way. It’s important to leave some of the larger plants to continue seed production. But the plant propagates easily from rhizome division, too. If diggers would simply replant some of the roots when they’re digging goldenseal, it would help the plant rebound. When properly harvested, a goldenseal colony will rebound with even more plants in the colony than existed before harvest. When exhaustively harvested, the digger takes all of the older plants and as many of the smaller plants as possible, leaving only very tiny rootlets behind for replenishing the colony, which takes at least three years to grow to seed-producing maturity again. It’s the middle of winter right now and time to propagate so we have new plants to sell at the market in spring. It’s also the time to dig goldenseal for its medicinal virtues. Here at Wild Ozark we never practice exhaustive harvesting of anything, except of the vegetables in our kitchen garden. I’ll be taking special care not to dig more than a few of the mature goldenseal plants and will only harvest from a small area at a time. We have goldenseal plants available from our Wild Ozark nursery. Bare-root plants (rootlets) are available October through the end of November. We’ll have potted plants available in spring for local customers, and I start shipping them to mail-order customers in May. Come with me up the mountain to find the goldenseal hidden beneath the winter blanket of leaves. Here’s the view before we start up the mountain. Our own road up there is washed out so we have to go through the neighbor’s field to get there. We’re always very careful to make sure gates are securely closed behind us so the cows and mules don’t get out. Looking across the neighbor’s valley. Getting ready to start up the trail. It’s pretty steep and this old logging road switches back a few times before we reach our own road. If I were walking all this trip, by the time I got there I’d be too tired to be digging goldenseal! Getting ready to go uphill for a while. There’s a tree with oyster mushrooms on it by one of the gates. Now we’re on the level where the goldenseal patch grows and you can see through the trees across the same valley we looked across earlier. There’s a colony of rattlesnake or grape ferns already beginning to grow. These two ferns look very similar to each other and until it sends up the spore frond I don’t know which is which. The bronze one was probably up before the last frost and the cold turned it bronze. I am not sure about this, but that’s my guess. If you know why some are bronze and some are green, please do tell. The valley we looked at earlier, this time after traveling up all the switchbacks. Since it’s winter, none of the goldenseal is growing yet and all of the tops have fallen away to molder along with the tree’s leaves. It would be hard to find except I have a pretty good idea where it is. This stack of rocks marks a spot where I’d planted ginseng and goldenseal years ago. The stacked rocks mark a planting location. All you can see on the ground are leaves from last year and here and with bits of moss on the rocks for greenery. But in the right spot, when the leaves are brushed aside, the goldenseal buds proclaim their presence with bright gold buds. My first attempts at finding it were not successful, but once I moved farther away from the rock stack I found them. See the bright yellow point (one in the foreground and one behind it just barely showing)? That’s goldenseal waiting for spring to arrive. Here’s pictures of the roots after bringing them up. The larger ones will be divided. Everywhere there are roots coming off of the main rhizome is a spot where I may divide. Goldenseal is a plant that comes back even more plentiful after being dug. One year someone had stolen the entire patch, or so it seemed. An old timer in town patted me on the shoulder and said “don’t worry, it’ll be there next year”. Boy, was he right. It was back and twice as plentiful. The only drawback is that the new plants are younger and may not be large enough for selling as roots for medicinal use for a few years. After gathering enough to plant and pot up in the nursery I headed back home. I only gathered some from the area where I knelt on the ground in that one spot. There’s several hundred more of them, possibly a thousand or more, biding time until spring calls them forth to unfurl in the light. I have this post as a free downloadable information sheet on goldenseal at our Wild Ozark online shop. The photo above of the goldenseal in fruit is a photo in the book and an image from the DVD that comes with my book (while supplies last), “American Ginseng & Companions“. There are photos of goldenseal unfurling in spring in my Kindle picture book “Into the Ginseng Wood” collection, in the chapter of that series (“The Unfurling“) posted to Amazon. Goldenseal with Red Berries is the first in a collection of American Ginseng & Companions photographic prints available from Wild Ozark. Signed & Numbered prints are available now! Wild Ozark™ Nursery specializes in American ginseng and companion plants for ginseng habitat restoration and Arkansas native plants. We also carry some non-native varieties, many of which are introduced and naturalized during the early settlement of our area, but I usually avoid those that have become invasive (like Japanese Honeysuckle, for example). And we have books and other information sources with lots of pictures of plants on our website free for the browsing (use the menu links above). Notice: the flash flood in June 2015 wiped out the nursery except for ginseng seedlings. We’ll have the native plants restocked (stocks will always be low) in spring 2018. If you’re coming from a distance and won’t make it by noon on market days, I’m usually happy to loiter in town a bit longer so we can connect. Seed storing tip: I have learned that you can’t keep the ginseng seeds in the refrigerator so long or else they will go dormant. It’s best to keep them in layers of sand outside in a cool and sheltered place if you can’t plant them right away. The seeds I have aren’t dead, they just might not sprout this year. (Thanks to Dennis at Ozark Mountain Ginseng for this information!) Next year they should all sprout on schedule. I’ll have some seedlings to sell at market this year, just not so many as I’d planned for. I’ll update this list periodically as I sell out or have new offerings. Shipping will not be available until September 2016 (bare-root only). Where do we get the plants? All of our plants are sustainably propagated from plants at Wild Ozark or from purchased seeds (it is illegal to harvest wild ginseng seeds for propagation). Those plants that live here and make viable seeds are propagated by seeds, and we always leave seeds/berries on the plants so the natural colony can reseed. Some plants, like goldenseal, black and blue cohosh, wild ginger, and bloodroot, do exceptionally well with divisions. We would never threaten the survival of any of our plants by over harvesting for the sake of selling plants. Because of this, and because 2015 will be our first year in business as a nursery, our supplies will be limited. If you want to make sure of what we will have on any given week at market, please email by the Sunday before. If you give assurances that you’ll be there to pick up your plant, I’ll hold your request so you won’t make a trip out for nothing. We will be happy to go to logging/development sites to rescue any of the ginseng forest companions. If you have development activity planned in such areas, please let us know. Here’s a few photos of ginseng habitat companions.